This work features hundreds of informative illustrations! If aviation is your profession - or if you're simply an aircraft enthusiast - here's an authoritative, easy-to-use resource that puts a world of technical information right at your fingertips. 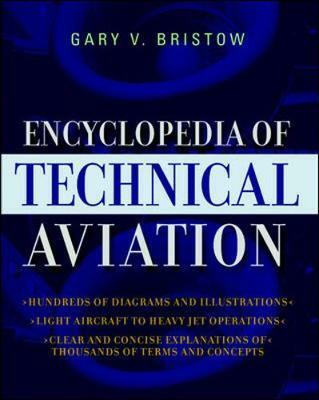 Written by noted aviation expert and airline pilot Gary V. Bristow, the comprehensive "Encyclopedia of Technical Aviation" offers coverage of a complete range of technical aviation topics, with each alphabetically arranged entry designed to provide maximum insight. From absolute ceiling to jetstream, rotation rate to wind drift formulae, and everything in between, this encyclopedia covers it like no other resource available. With the "Encyclopedia of Technical Aviation", you get instant facts on topics such as: aerodynamics; engines; aircraft performance; aircraft speed; atmosphere; meteorology; navigation; type qualifications; and much, much more! Packed with hundreds of useful illustrations, the "Encyclopedia of Technical Aviation" is an essential reference for industry professionals and students. Locate key data, improve safety conditions for yourself and others, and especially, increase your opportunity for job security and career advancement. From light aircraft to heavy jet operations and everything in between, the "Encyclopedia of Technical Aviation" is the one-stop, info-packed resource you need to keep your working knowledge of aviation flying high! Features hundreds of informative illustrations! KEEP FLYING SPEED WITH THIS UNIQUE, COMPREHENSIVE RESOURCE! If aviation is your profession -- or if you're simply an aircraft enthusiast -- here's an authoritative, easy-to-use resource that puts a world of technical information right at your fingertips. Packed with hundreds of useful illustrations, the "Encyclopedia of Technical Aviation" is an essential reference for industry professionals and students. Locate key data, improve safety conditions for yourself and others, and especially, increase your opportunity for job security and career advancement. From light aircraft to heavy jet operations and everything in between, the "Encyclopedia of Technical Aviation" is the one-stop, info-packed resource you need to keep your working knowledge of aviation flying high! Gary V. Bristow is an airline pilot who was inspired to write the Encyclopedia of Technical Aviation while training and working as an airline pilot. During that time, Bristow realized his sources for information were not always readily available, and set about to compile and write a centralized, easy-to-use guide for aviation professionals and enthusiasts. This book is the result of that inspiration. Bristow's first book, Ace the Technical Pilot Interview, was published by McGraw-Hill in April 2002.